By Brendon G. Tillman, M.D., Mickaila J. Johnston, M.D. A 26-year-old woman with multiple endocrine neoplasia type 1 (MEN1) was referred for positron emission tomography-computed tomography (PET-CT) to evaluate a new pancreatic mass. 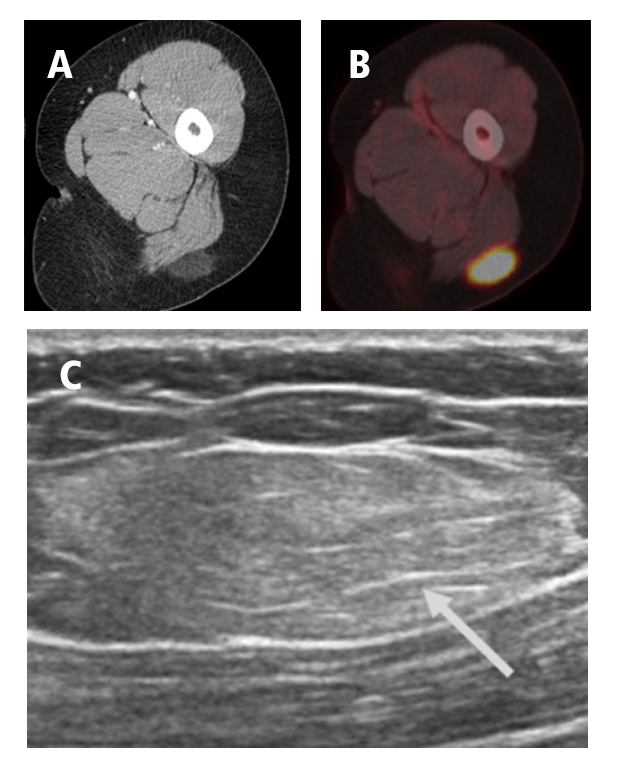 Axial CT (A) and fused PET-CT (B) images show an ovoid hypermetabolic low-density lesion in the subcutaneous fat of the left thigh, abutting the posterior muscular compartment. Subsequent ultrasound shows the lesion to be hyperechoic (C, arrow). Differential considerations included hibernoma, liposarcoma, atypical lipoma, and metastases. Ultrasound-guided biopsy revealed a hibernoma. Hibernomas typically have attenuation between fat and muscle with varying degrees of enhancement.2 On ultrasound, hibernomas are usually well-delineated and hyperechoic, similar to lipomas. They are intensely fluorine 18 fluorodeoxyglucose (FDG)-avid and have signal intensity similar to fat on MR. Imaging is not diagnostic. Percutaneous biopsy can be helpful, but surgical excision is usually recommended. Murphey MD, Carrol JF, Flemming DJ, et al. From the archives of the AFIP: benign musculoskeletal lipomatous lesions. Radiographics 2004;24(5):1433-1466. Daubner D, Spieth S, Pablik J, et al. Hibernoma – two patients with a rare lipoid soft-tissue tumour. BMC Med Imaging 2015;15:4. Disclaimer: The views expressed in this article are those of the author and do not necessarily reflect the official policy or position of the Department of the Navy, Department of Defense, or the U.S. Government. Tillman BG, Johnston MJ. At the Viewbox: Hibernoma. J Am Osteopath Coll Radiol. 2016;5(3):27. Brendon G. Tillman, M.D., Mickaila J. Johnston, M.D. Drs. Tillman and Johnston are with the Department of Radiology, Naval Medical Center San Diego, San Diego, CA.